Corrosion rate measurements are made using the linear polarization resistance technique. The instrument measures the current required to polarize the electrodes of a probe to a known potential. From the polarization potential and the measured current, polarization resistance can be calculated. Then, using Faraday’s law, the instantaneous corrosion rate can be calculated from polarization resistance. 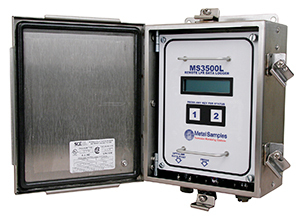 The MS3500L takes probe readings on a user-programmable logging interval. Readings are time and date stamped as they are taken, then stored to memory. Between readings, the instrument remains in a "sleep" mode to conserve main battery power. The instrument’s memory is capable of storing 3,000 readings and is protected by a lithium back-up battery. Stored data can be uploaded to any PC as a comma-delimited ASCII text file. Because the data is in ASCII text format, it can be imported into any standard data analysis program such as Microsoft Excel. Data can also be reviewed on the instrument’s LCD display for quick reference.